First Light - Broadmoor is a piece of digital artwork by Joseph Bohler which was uploaded on January 13th, 2010. 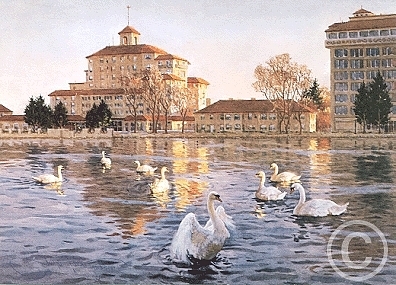 The Broadmoor Hotel is seen from the lake which is in back of the Itallian influenced architectural buildings reflected in the lake. Mr. Bohler has captured the light of Colorado and the image seems to glow. This is a beautiful rendition of this famous 5 Star hotel. See it framed at Art Gallery of the Rockies with three archival mats, UV protection clear glass and a wood with gold frame, overall size 24" x 29.5" wide.